Hoping you all have a great weekend. This is always the last big splash here for summer. In about two weeks we’ll shut down the pool for the winter, put all the beach stuff away, and I’ll start my Christmas projects for the year. I always make a few things that take a little bit of time and effort. I’m not really sure I’m ready for summer to end as we had a bit of an abbreviated one this year and I missed having our grandkids around since they moved to CO in June. Luckily we have a trip planned to CO in two weeks so I’m dragging out our summer by a little bit. Hopefully I won’t need to take my winter clothes along this year. We generally take off for the beach every Labor Day weekend but this year we’re just having a few friends over on Monday for a BBQ, swimming, and probably some cards and drinking………………that’s where we usually end up anyway with this particular party crowd. Anyway, whatever you’re doing I hope it’s either fun, or relaxing, or both! I don’t think bonds are closing early today, but for all intents and purposes they are as most of the Street will be gone by noon ahead of the 3 day weekend. The ISM Milwaukee index fell to 59.6, however the Chicago Purchasing Managers Index rose to 64 and the University of Michigan Consumer Sentiment Survey rose to 82.5. Ready to pop the champagne over the good consumer sentiment numbers? Well, it has yet to flow through to actual spending. Personal Spending fell .1% in July, however the reason was falling energy prices. Ex-food and energy, spending increased .1%. That said it isn’t that strong of a number. Personal Income rose .2%. One of the interesting features of this recovery has been the disconnect between the reported unemployment rate and the actual health of the labor market. While unemployment keeps falling, the labor market still doesn’t feel much better. 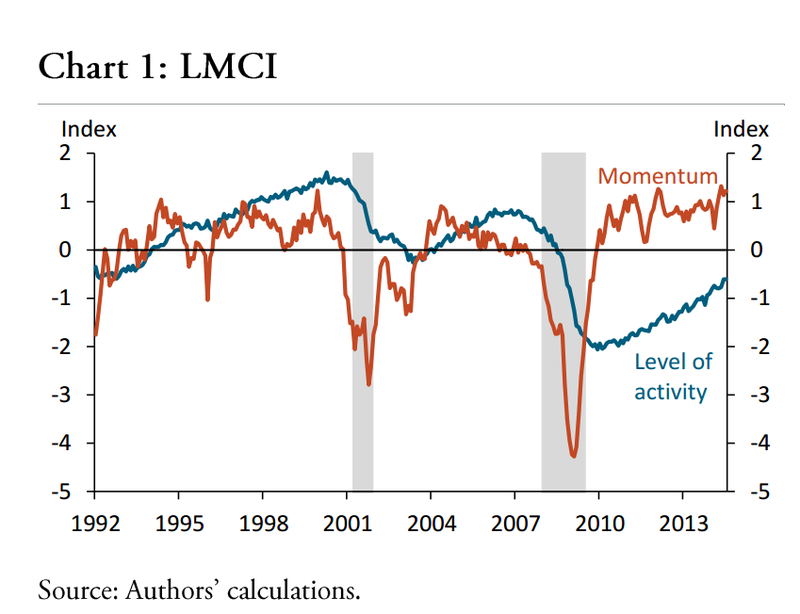 The Fed is now looking at an index comprised of 24 indicators called the Labor Market Conditions Index (LMCI) to describe the health of the labor market. There are two pieces to the index – the current level of activity and momentum. The momentum indicator gives you clues as to where the market is going in the future. Here is what it looks like at the moment – about a year away from normalcy. Short missive as there is not much going on. Have a happy Labor Day everyone. I posed a question up on Plum Line today and got some interesting responses. I think NoVA and jnc were active on the thread. We’ll make it a two parter. I thought Brent, Kevin or Mark might be interested. 1. Your employer pays for your family’s health insurance at a cost of $12,000 per year. Said employer offers to drop the coverage and increase your salary by the same amount. Under current law, you lose the tax benefit of deductibility, but gain the liberty to purchase whatever insurance you like. Is it worth the price? 2. Same as scenario #1, but assume that current law is changed to make health insurance deductible on Schedule A. That or make employer provided health insurance taxable. I was effectively asked the first question when negotiating terms for a possible new position. I responded that I would have to purchase health insurance of some kind as my better half is a freelancer. The offer included health insurance. I’d take it that way as I don’t care for the tax hit. I’d say yes to Question #2 as I dislike the link between health insurance and employment. It’s a relic of wage and price controls from the 40s. The U.S. spends as many public dollars as most developed countries do and then kicks in a few more precent of GDP. Markets are lower this morning on tensions in Ukraine. Bonds and rallying as well. Some strong economic data this morning, with the second revision to 2Q GDP coming in at 4.2%. Consumption rose to 2.5% and the PCE price index (the Fed’s preferred inflation indicator) came in at 2.1%, with the core at the Fed’s target rate of 2%. Initial jobless Claims came in at 298,000, another strong number. The Bloomberg Consumer Comfort Index rose to a 5 week high. Pending Home Sales rose 3.3% in July, but are down 2.7% year-over-year. The Ellie Mae Origination Insight Report is out. Refis dropped to 32% of all loans in July. FHA accounted for 20%, Conventional 64%, VA 11% and other 5%. The average FICO dropped to 727. Fannie Mae has taken down their estimate for housing in 2015. They dropped their estimates for housing starts and new home sales by 17%. People hoping that 2015 is the breakout year in housing are going to be disappointed. New rules on PMI could raise rates on average 15 basis points. The elderly are finding the amount they owe on their mortgages increasing. Not sure how much of this is due to reverse mortgages. The mortgage-burning party seems to be a thing of the past. Consumers have confidence, but not the cash to do anything about it. This is why the consumer confidence numbers look good, but spending numbers are not. Asset prices can only do so much – the chief driver of spending is wages, not asset prices. In fact, home equity extraction during the bubble years masked the overall weakness in wage growth. Stocks are higher this morning as the S&P 500 crossed the 2000 level yesterday. Bonds are following the rally in Europe. The German 10 year hit 90 basis points this morning. Slow news day. Going to be a short missive because there isn’t much to talk about. Mortgage Applications rose 2.8% last week. Purchases rose 2.6% while refis rose 2.8%. Refis were 55.7% of all mortgages originated. As European economies continue to struggle, the speculation is that European Central Bank Head Mario Draghi will announce some sort of quantitative easing early in September. Blackrock was just appointed as the ECB consultant for the ABS purchase program, it looks like the ECB is serious about going down this route. Rallies in European stocks and bonds are dragging US stocks and bonds along for the ride. Remember the PIIGS? The US 10 year yields just a touch less than Italian sovereign debt and about 20 basis points more than Spanish sovereign debt. Let that sink in. Durable goods orders were all over the map due to a big jump in aircraft orders. The headline number increased 22.6%, however the number most pros focus on – Capital Goods Orders Non-defense / ex-aircraft was down .5%, however June was revised up big, from 1.4% to 5.4%. The Richmond Fed Manufacturing Index rose to 12 from 7. 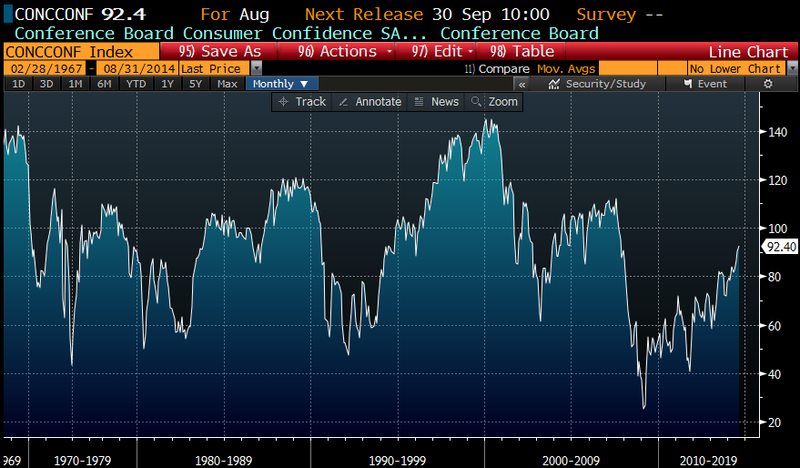 Consumer Confidence rose to 92.4 in August, from 90.3 the prior month. This is a post-recession high and we are approaching historical normalcy. Lets see if this translates into good personal spending numbers on Friday. It is official: Burger King is buying Tim Horton’s and plans to move its headquarters up north. Expect the usual kvetching about “corporate patriotism” out of the usual suspects. That said, Walgreens was jawboned into not moving their headquarters, but the stock was slammed on the decision. I am curious as to whether the left will go after the company by threatening a boycott or will go after Burger King Worldwide’s biggest shareholders – 3G and Pershing Square. That said, 3G is a Brazilian investment firm, and who knows if Ackman holds BKW in its onshore or offshore accounts. BKW could already be more or less foreign owned to begin with. House prices are down month-over-month and year-over-year according to Case-Shiller. These are the seasonally-adjusted numbers – the non-seasonally adjusted numbers were still up .9% month over month. Separately, home prices continue to rise, according to FHFA, with the index up .4% from May. Prices are up 5.1% year-over-year. The FHFA index is different than Case-Shiller in that it only looks at homes with a conforming mortgage, which means it excludes distressed and high end home. It is more of a central tendency index and tends to be less volatile than Case-Shiller. Markets are higher this morning on no real news. Bonds and MBS are up small. Lots of economic data this week: Tomorrow we get durable goods, the FHFA Home Price Index and Case-Shiller. Thursday, we get the second revision to second quarter GDP, and Friday we get Personal Income and Personal Spending. On GDP, note that the Street is forecasting the advance estimate of +4.0% gets revised downward to +2.4%. If that ends up being the case, we will have had almost no GDP growth for the first half of 2014. Why have the strategists gotten it so wrong with their bond market predictions? (Mea Culpa – include me in that camp). One explanation is that they are looking only at the US and ignoring the weakness emanating out of Europe. The second explanation is that inflation just cannot be found – the rally in the dollar has depressed commodity prices and there is little to no upward pressure on wages. This also might help explain why the Fed is considering hitting some bids with its paper once QE ends. Another corporate inversion story: Burger King is apparently in talks to buy Canadian-based Tim Horton’s. Note Walgreen’s decided to scrap their plans for moving their headquarters and the stock got demolished. The takeaway from Jackson Hole? Labor markets need to heal more before the economy can weather higher interest rates. Wage growth is flat right now. In order to get to the Fed’s 2% target on inflation, we would need to see wage growth of around 4%, because productivity-driven increases are non-inflationary. This just goes to show how far we have to go. That said, the economic staff at the Fed has taken down its estimate of the potential non-inflationary GDP growth, so there might not be as much slack as people think. Think home flipping is dead? Think again.